Health Education to Advance Leaders in Integrative Medicine (HEAL-IM) is a UCI School of Medicine program designed to provide a future generation of physicians with additional training and skills in the tools and philosophies of integrative medicine. This four-year longitudinal medical student program (with an optional fifth year of instruction) is dedicated to supporting the practice of evidence-based, compassionate, whole-person care to benefit the treatment of patients and families, our community and healthcare as a whole. HEAL-IM medical students may also choose to spend an optional fifth year completing certified integrative medicine training (in acupuncture, osteopathic manipulation therapy, medical hypnosis and culinary medicine) or pursuing a master’s degree supporting the effective implementation of future integrative medicine practices. HEAL-IM is designed to focus specifically on advancing integrative medicine research, education and clinical practice to promote individual and population wellness. We are driven by a mission to provide a sound foundation in the principles, philosophy and evidence-based practices of integrative medicine, setting the stage for future professional study and practice. Underlying the spirit of integrative medicine is the commitment to involve the patient as an active partner in his or her care, with a focus on teaching self-care and self-management tools, as well as supporting healthy lifestyle behaviors that are the basis for optimal health and wellness. Integrative medicine also highlights the need for health equity and for ensuring access to much-needed prevention and wellness resources in underserved communities. Fundamentally, integrative medicine recognizes that health systems need to move beyond just the diagnosis and treatment of disease complications (pathogenesis) to fully embrace health creation, or salutogenesis. We believe the combination of evidence-based integrative care, together with advanced conventional treatment options, form the basis for providing our patients with the most effective, compassionate, whole person medical care for the 21st century. New HEAL-IM students will meet with the program's faculty and leadership at the start of the school year to review expectations and aspects of curricular elements. First- and second-year students will participate in 90-minute monthly seminars and a workshop series that will include presentations by a rotating panel of UCI and integrative medicine community specialists on topics covering a range of integrative medicine practices and skills. During the second, third and fourth years of the HEAL-IM curriculum, students will participate in a quarterly multidisciplinary patient-care conference. This will include patient case presentations by faculty in family medicine, osteopathy, nursing, naturopathy, as well as practitioners of traditional Chinese medicine, chiropractic and Ayurvedic medicine. Fourth-year HEAL-IM students are each required to present one case during the year. 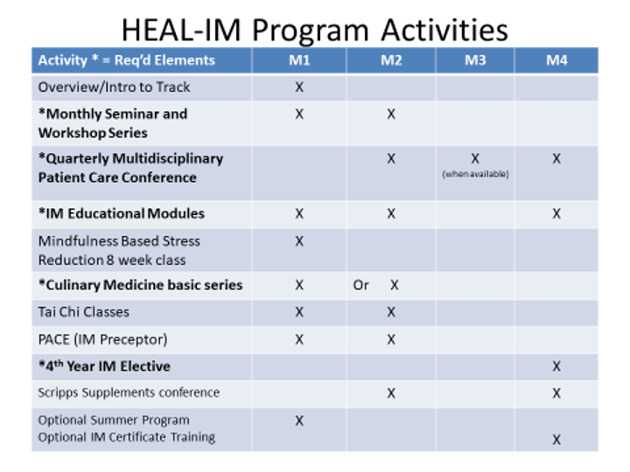 Throughout the four years of the program, HEAL-IM students also will complete a variety of online evidence-based education modules through the University of Arizona covering a broad span and scope of integrative medicine. Module topics during the first year will include wellness, resiliency, nutrition, mind-body and exercise. Module topics for year two will cover integrative medicine modalities and motivational interviewing. Various clinical topics will be covered in years three and four. First- and second-year students also will have PACE sites (Patient-Centered Clerkship, a longitudinal clinical rotation that is designed to introduce clinical knowledge and skills to students and to integrate basic science training into the clinical setting) at integrative medicine clinic practices at UC Irvine Medical Center, the Susan Samueli Integrative Health Institute and in other offsite clinical locations in community. Throughout their medical school education, HEAL-IM students will be trained and mentored by physicians and providers with expertise in integrative medicine. To be considered for the HEAL-IM program, applicants first must be accepted to UCI School of Medicine. Upon acceptance to the medical school, a separate application will be available for prospective students. Applications will be reviewed by the HEAL-IM interview committee and students selected for an interview will be contacted. Tuition and fees for the senior year of medical school (as well as an optional fifth year) will be awarded to HEAL-IM students who maintain efforts that are satisfactory and above in the program and throughout the medical school.